You have lighting around your home and outside your home, so why not control those lights the easiest way possible? With traditional light switches, you have at least one switch per light making your home a clutter of switches. With improved lighting control, at the front door, you could have a button that will show off the artwork around the house, turn on all landscape lighting, or put the house into party mode! 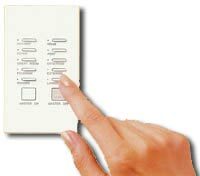 With added features like all lights on/off, time clock or path lighting, a control system gives added flexibility and convenience over traditional light switches. No longer would you have to go from room to room switching on or off all the appropriate lights.